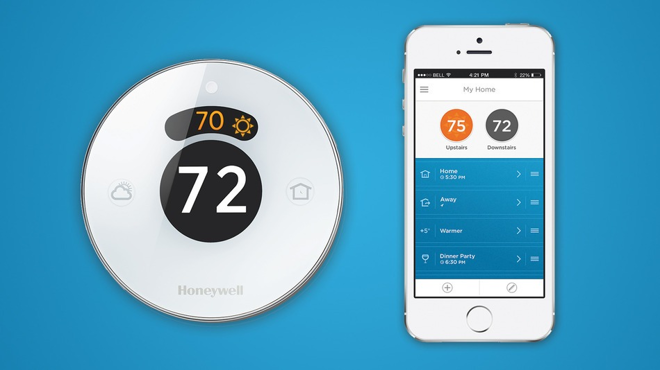 Honeywell, a name familiar to hundreds of millions of consumers around the world thanks to its iconic round thermostats, is gearing up to put its own spin on the "internet of things" with a new, Internet-connected thermostat called Lyric. Lyric's flagship feature is the ability to alter the temperature of a space dynamically. The most basic regulation is done using the owner's location, much like competing products from companies like Nest, which was recently acquired by Google. "Most people don't have a predictable pattern to how they live their lives; why not have a thermostat that adjusts based on your real-time schedule?" Honeywell executive Beth Wozniak said in a release. "With the Lyric thermostat's geofencing capability, my house returns to my preferred comfort setting when I'm within a few miles from home. Quite simply, the Lyric thermostat offers me the ability to keep my life in tune delivering comfort when I'm home and savings when I'm gone." Honeywell has gone one further, however, with a new addition called Fine Tune. Fine Tune takes environmental factors like existing indoor and outdoor temperatures, humidity, and weather into account when adjusting the heating and cooling levels. This allows Lyric to find "the most comfortable temperature" for occupants, Honeywell says. Lyric works alongside a smartphone app that allows for remote control, but it can also operate independently with controls located on the thermostat itself. A proximity sensor illuminates the display when a user walks up to it, showing the current temperature and a color ring indicating the system's status —orange for heating, blue for cooling, or green for energy saving mode. The display can also show current and future weather data. Honeywell is one of a number of manufacturers that have partnered with Apple to support HomeKit, the iPhone maker's new home automation standard introduced with iOS 8. It is unknown whether Lyric will receive an update with HomeKit integration once iOS 8 ships this fall, though such an occurrence is likely. Lyric is available now from HVAC contractors and will be on retail shelves in August for $279.